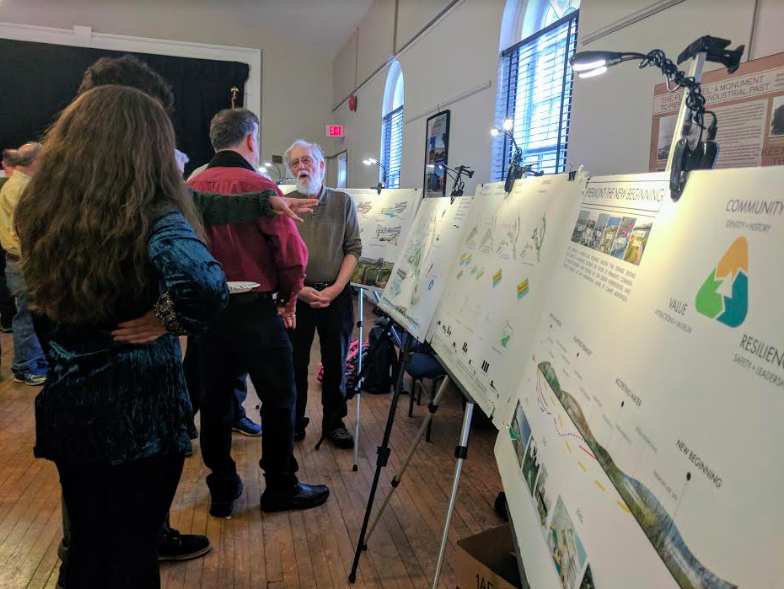 Last week, students from Cornell University’s Landscape Architecture 4010 course, the Climate-Adaptive Design (CAD) studio presented their ideas for landscape architecture, urban planning and engineering to Piermont residents and stakeholders. The studio links landscape architecture students with flood-risk Hudson Riverfront communities to explore design alternatives for more climate resilient, beautiful and connected waterfront areas. “Our goal is to provide alternative strategies and to inspire people to talk about what a future for Piermont might look like,” Josh Cerra, associate professor at Cornell University, Department of Landscape Architecture, emphasized. Past CAD studios were held in Catskill, Hudson, and Kingston. Six teams of students, including those focusing on urban and regional studies and engineering, visited Piermont in September and October, Cerra explained. They met with stakeholders, collected information and learned about the residents’ visions for the village and climate projections within that context. A workshop during the second visit showcased their early ideas and gave stakeholders a chance to voice their concerns. “Piermont has been on its radar as the village is working with the DEC, Scenic Hudson and other resiliency programs,” Village Trustee Lisa DeFeciani explained. “CAD teamed with the DEC’s Hudson River Estuary Program” with help from DEC climate outreach specialist, Libby Zemaitis, who coordinated efforts between the students, the agency, and other technical partners. The village received a $35,000 state grant in 2014 to work with Scenic Hudson and the Consensus Building Institute to plan for sea level rise and flooding outlined by the Piermont Waterfront Resilience Task Force (PWRTF). Piermont Waterfront Resiliency Commission was formed to carry out the recommendations of the task force. Students improved the village’s bicycle and walking connections and designed a partially-elevated waterfront district with mixed-use development and pedestrian access. Other students imagined homes that stayed in place while floating on water. Their strategies offer results that may increase the village’s ability to adapt to climate change related hazards. “Some of the ideas were inspiring and gave us hope that the village will survive and change.” Sparkill Creek Watershed Alliance representative Margaret Grace agreed. Although the students’ plans would hold positive outcomes for the village, DeFeciani agreed the conversation — while necessary — is difficult for some residents, as diagrams indicated their neighborhoods might be under water within 50 years. The village Planning and Zoning Boards would have to approve the implementation of any new plans as some designs require changing the zoning codes. CAD studio research is funded by New York State Water Resources Institute funds and Engaged Cornell, which represents students seeking positive change through community-engaged work.